International Journal of Research in Health Sciences,2013,1,3,165-170. 1-Associate Professor, SDM College of Physiotherapy, Sattur, Dharwad. 2-Clinical practitioner, Karwar, Karnataka, INDIA. Introduction: Many developmental scales are used to assess motor development. Primarily these scales are developed in western countries. The scales developed in India are also not widely accepted, due to cultural and ethnic differences. The Peabody developmental motor scale has not been used in rural population, hence study was undertaken to evaluate rural children in this part of India (Dharwad, Karnataka). Objective: Assessment of motor development scores of normal children in Dharwad (rural) on Peabody developmental motor scale second edition (PDMS-2). Materials & Methods: Total 180 children boys and girls of age 0-5 years were taken for assessment after parent consent and paediatricians declaration that the child was normal. All children were assessed on PDMS-2 and all the items used as per the instructions in the manual. One way ANOVA and student t-test was used for statistical analysis. Results: PDMS-2 is valid for 0-5 years of children. The boys of Dharwad (rural) population scored more than girls in object manipulation subtest (p<0.0142). Dharwad (rural) children scored lower than PDMS-2 scores in stationary, locomotion, object manipulation, grasping and visual-motor integration (p<0.05). 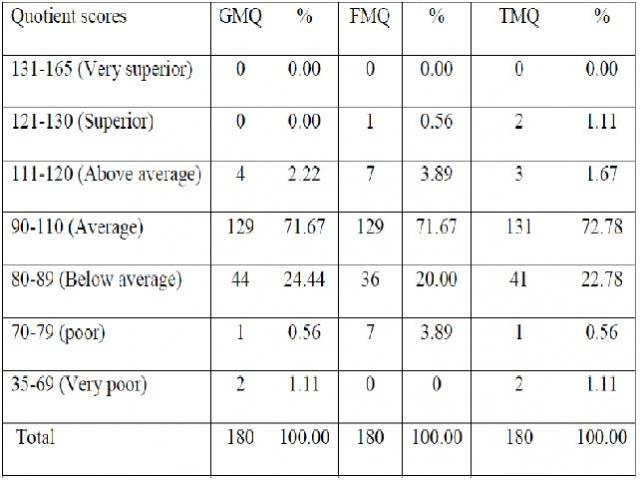 There is significant change in Gross Motor Quotient (GMQ) Total Motor Quotient (TMQ) and Fine Motor Quotient (FMQ) as compared to PDMS-2 scores Interpretation. Conclusion: Item wise analysis with heterogeneous sample needs to be undertaken with PDMS-2 scale for its validity. Hence when using PDMS- 2 and interpreting their scores in Dharwad (rural) children, examiner should be cautious.